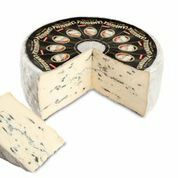 Cambozola Black Label (Triple Creme Blue) - Zuercher & Co. The Black Label Cambozola is cold aged. It is aged longer than the traditional Cambozola. The additional aging time allows the for greater growth of the blue veining, resulting in a more pronounced blue flavor, buttery texture, and rich flavor.